Having endured the horrid civil war in Beirut, photographer Fadi Boukaram fled to the United States in 2005 to complete his post-graduate studies. While conducting a simple google search of his country, Fadi was surprised when he uncovered over 45 cities, towns, and villages, that are also called ‘Lebanon’. Actively researching these areas, Fadi discovered that in 1955, president Camille Chamoun invited seven mayors and representatives from the Lebanons of Indiana, Ohio, Oregon, Missouri, New Hampshire, Nebraska, and Tennessee for a two-week visit in Beirut. Three Arab photographers at forefront. 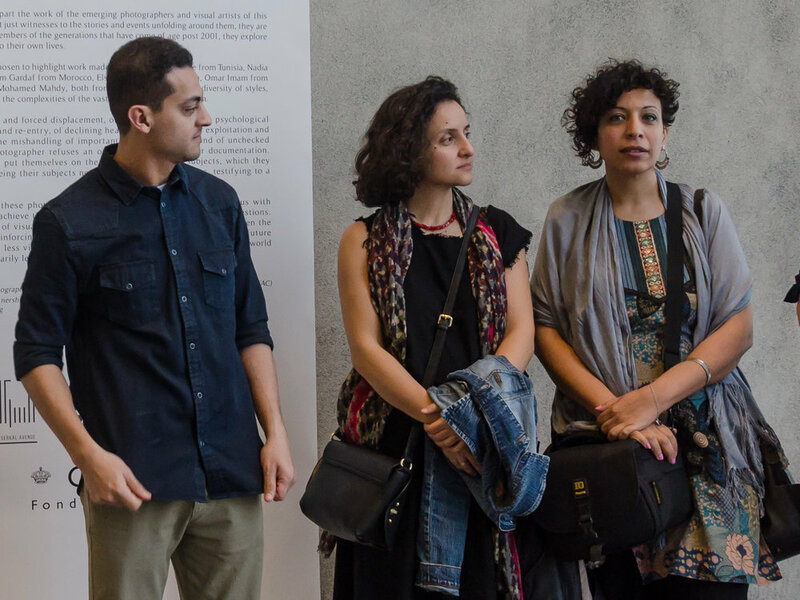 Lebanese photographer Elsie Haddad along with Egyptian photographers Mohamed Mahdy and Heba Khalifa took center stage during GPP Photo Week’s guided walk-through of the group exhibition “The Shortest Distance Between Us: Stories from the Arab Documentary Photography Program” on February 5th. Launched at the opening of GPP Photo Week, and in collaboration with The Arab Fund for Arts and Culture (AFAC), the exhibition features seven photographers from The Arab Documentary Photography program (ADPP) and displays some of the most enthralling photography projects from around the Arab world. Lebanese photographer Myriam Boulos is continuously striving to find her place in a conservative yet eccentric city. While questioning the need for belonging to a distinct social group, and the relationship between impulsive partying and the instability and insecurity of Lebanon, Lebanese photographer Myriam Boulos captures candid images of the night owls who continually gather at Beirut’s most iconic underground club B0 18. A purge that has consumed Lebanon’s society, ‘Vertiges du matin’ or ‘Morning Vertigo’ is symbolic of a nocturnal reality that many seek as a form of escapism. Photographing the loyal regulars who search for a temporary rush and suffer from chronic dissatisfaction, Boulos’s first oeuvre explores Beirut’s, end of a night out. Documenting both the ordinary and the extraordinary, renowned Franco-Syrian photographer Ammar Abd Rabbo is considered one of the most prominent photojournalists of the Arab world. Signing over sixty magazine covers, his photographs have appeared in Time Magazine, Paris Match, Der Spiegel, Le Monde, and Asharq Al Awsat to name a few. Abd Rabbo’s work has been syndicated in the world’s most extensively circulated publications, meriting him numerous awards and accolades over the years. Egypt’s leading photography institution is seeking to raise awareness around photography. Amid Egypt’s ‘January Revolution’ of 2011, former banker and photography enthusiast Marwa Abu Leila abandoned her eleven-year corporate career to venture off into the world of Image making. Out of shared interest, friends and co-founders, Abu Leila and Karim El Khadem entered the world of photography with a neutral and raw approach. Without any preconceived notions, they were able to immerse themselves in a field that is very rich, and diverse. On January 16, 2019, Mina Image Centre will be launching its first exhibition “Untroubled” curated by Matthieu Humery and dedicated to one of the major photographers in the 20th century, Irving Penn, whose work will show for the first time in the Arab World. The exhibition will run till April 28, 2019. Recognized as one of the masters of photography of the twentieth century, Irving Penn (1917-2009) is known for his striking images, masterful printmaking, and his pioneering work in both commercial and artistic photography. Echoing a poetic, and melancholic visual, is the meticulously surreal dual portrait of Aurélia and Raïa, from the series ‘Ombres projetées’ a collaborative body of work by Lebanese photographer Caroline Tabet and designer Wafa Aoun. Photographed with a medium format analog camera, in the old Abroyan textile factory in Burj Hammoud, a neighborhood situated in the suburbs of Beirut, ‘Ombres projetées,’ is a series that questions the notion of twins and dualities. Uncovered through the eyes of Lebanese photographer and writer Samer Mohdad, the photograph of an orphaned boy carrying the bullet pierced portrait of his murdered father is strikingly expressive. Composed with sharp and bold contrasts between light and dark, the socially, and politically aware photograph, from Mohdad’s body of work ‘War Children, Lebanon 1984 – 1992’, echoes the many beguiling narratives of the innocent lives that were affected by the cruelty of the Lebanese conflict. Falling victim to the gruesome bloodshed battles that broke out in Beirut in 1975, the then ten-year-old Mohdad and his family had to seek refuge in Aley, a village located in Mount Lebanon. ‘Fleeting Acts’ is a series by Lebanese Photographer Munir Abdallah which explores the transitory, transform, and ritualistic acts of homosexual couples. The opening of the exhibition will take place on November 28 at 6 pm at ARTLAB Gallery. A photographic series by Lebanese artist Chaza Charafeddine that celebrates migrant workers in Lebanon. Resembling a scene from the well-known tv series Hareem Al Sulatan, the carefully constructed set design in the portrait of ‘Nadine’ a migrant worker embodying Sultana is intensively decorated with a variety of elements reminiscent of the luxury, wealth and royalty that once ruled the historical ottoman palaces. Suggestive of the ‘Tableau Vivant,’ ‘Nadine’ is one of twenty blatantly theatrical, and painterly like photographs portraying legendary personalities, celebrities, socio-political figures, and religious icons, from ‘Maidames’ a recent body of work by Lebanese artist and writer Chaza Charafeddine. A photo book by Lebanese Photographer and animal rights advocate Michel Zoghzoghi. The official launch of Michel Zoghzoghi’s new photography book Cattitude and the Unbearable Lightness of Woofing will take place on November 15 starting at 6 pm at Station Beirut. To bring out the unique characters and personality traits these animals have, Zoghzoghi eliminated any distractions by shooting his subjects in a studio environment, using a black backdrop. Represented by ArtHome Sauma and Cabbabé will be exhibiting their work in one of Paris’s major art fairs. Returning to the Carrousel du Louvre for its 7th edition, Fotofever Paris is an international contemporary photography art fair founded in 2011 by Cécile Schall. It aims to encourage individuals to collect photography and support artists throughout their lives by enabling the discovery of new talents and granting them access to the art market. Amongst the 93 exhibitors, ArtHome, an association Founded by Hala and Emmanuel Bavière in France will be representing Lebanese photographers Alain Sauma and Ghaleb Cabbabé who will be sharing the same exhibition space. A visual documentation by Patrick Baz of the lives, rites and rituals of the 21st century Christians of Lebanon. After consciously choosing to end his career in conflict zones, internationally acclaimed former war photographer Patrick Baz moved back to Lebanon in 2015 to revitalize his energy and rid himself of the all the traumas he encountered over three decades. Since the region was affected by the massacres of different minorities at the hands of extremist groups, Baz decided to venture off on a journey to uncover the current situation of the community he grew up knowing. Photographer and artist Vladimir Antaki announces the crowdfunding campaign for his photobook “The Guardians,” which features around 70 photographs of artisans, workers, and small traders that have been photographed in their environment. The campaign is ongoing and will be held till November 15 on the Zoomaal platform. Born out of the desire to document and pay tribute to the hidden gems in the heart of every city, Antaki traveled around Europe, the Middle East, and the United States to photograph what he refers to as Urban Temples. These mystical, unique and vibrant spaces are home to shopkeepers, who protect their temples. At first glance, the photograph of the quiet city hidden behind the bare concrete building dominates the scene of what is seemingly a mundane night in one of Beirut’s many construction sites. It does not take long for one to notice the subtle yet unsettling lifeless body of a woman found near the red blood like scaffold wrap. A chilling yet eerily familiar scene we may have witnessed in movies or crime TV shows, the photograph is from visual artist and clinical pathologist Lara Tabet’s most recent series. Inspired by Roberto Bolaño’s novel 2666, Underbelly is a body of work that explores the fictively alleged homicides that take place in marginal spaces of Beirut’s suburbs. Photographed with a large format camera, and paired with the careful construction of microscopic image making, Tabet’s images are similar to the forensic evidence collected from the crime scenes. A fictional story that uses photography and writing to blur the lines between reality and make-belief. Written and photographed by journalist Carla Henoud, Le Chariot de Farah is a fictional book that explores the tale of Farah the third generation of a family of fruit vendors at the Corniche. The book signing and exhibition opening under the same title will be held on Thursday, October 18 at Maison Rabih Keyrouz. Though Henoud’s interest in photography started at the age of eighteen, upon graduating from the Lebanese Academy of Fine Arts – ALBA, with a degree in graphic design, she abandoned her camera and invested her time in becoming a journalist. Co-edited by Nour Salamé, founder of Kaph Books, and Clémence Cottard Hachem, Head of Collections at the Arab Image Foundation in Beirut, and sponsored by Byblos Bank, On Photography in Lebanon is a collective publication that invites forty contributing authors from various areas of expertise to share their insight on photography. It also displays 380 photographs exclusively shot in Lebanon with the intention of opening a conversation on the mediums fragility and continual transformation at the cusp of a digital revolution. Throughout the 19th century, Lebanon was considered as a hub for orientalists who used photography as a means to record, recreate and illustrate the visible. The country’s rich visual history metaphorically represents the fragile and transformative states of a practice that has become the most universal, accessible and essential tool for communication. 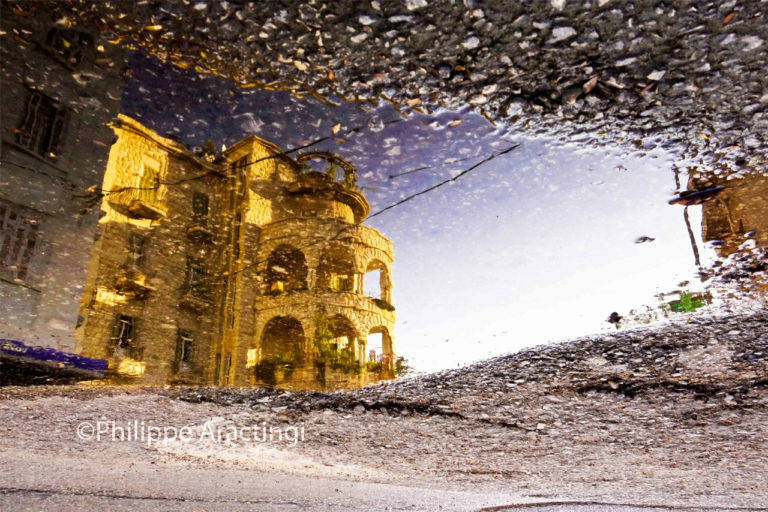 In the present atmosphere of a fiercely power struggle for existence, award-winning Lebanese film director and photographer Philippe Aractingi was left questioning his sense of belonging to his beloved Beirut. The Goddess like city that has endured vicious cycles of wars, death, rebirth, fear, hatred and unconditional love. Ephemeral dualities that have kept Beirut and her identity in constant states of flux. During the Lebanese civil war, whilst fearing the loss of his admired Beirut, Aractingi began photographing the chilling narratives of a war-torn city. He moved to Paris in 1989 to only fulfill his childhood dream of becoming a renowned film director. He came back to Lebanon in 2001 and found himself questioning his belonging to a city that has become almost unrecognizable. Over the years, Aractingi released over fifty documentaries and four award-winning long feature films which are recognized internationally. Czech photojournalist Joesph Koudelka was born in Moravia in 1938. Despite his interest in photography throughout his youth, he quit his job as an aeronautical engineer in Prague at the age of 29 when he decided to pursue photography full-time. One year into his practice, after his return from photographing a body of work on gypsies, Koudelka witnessed and documented one of the most historical events that took place in Europe, when the Soviet Union and other members of the Warsaw Pact invaded Prague and successfully terminated the reform in Czechoslovakia in August of 1968. At a very young age, self-taught Lebanese businessman-turned-photographer Michel Zoghzoghi’s love for predators, especially feline animals led him on quest to photograph, document and shed light on the significance of preserving and protecting the wild.In a conversation with wildlife photographer Zoghzoghi we discussed his incredible photographic journey of beauty, awareness and fragility that started about thirteen years ago. He was on his way to London to watch a polo tournament organized by his friend and bought his first camera at the airport.“The rest was history” he said. The insightful words of self-taught photographer and artist Maya Alameddine rang true as we sat down with her to talk about her visual storytelling journey that is equally controversial, thought provoking, beautiful and essential. Born in 1974 to a Tripolitan family, with her mother, an interior designer and her father an architect. The mother, woman, artist, photographer, social worker, and photo-therapist Alameddine grew up in a world where art had no boundaries. She exposed herself to the things she loved. Her photography has no limits or taboos. But, Maya points out that having no taboos doesn’t mean that one doesn’t have principles.